Jack Magruder, president of A.T. Still University, standing in front of the future school of dentistry in Kirksville. 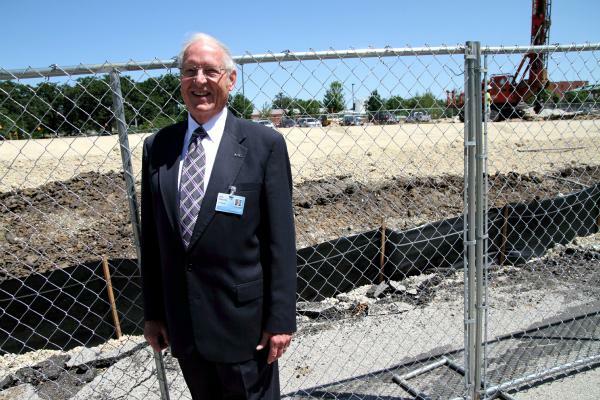 "It looks a little like a beach right now, but it will be a school," he said of the former parking lot and future dental school. "All across this state -- quite frankly folks -- all across this country, there is a huge gap in health care professionals in this bandwidth." The new school of dentistry at A.T. Still University will welcome its first class in the fall of 2013. Jack Magruder, the university president, said the goal is in part to help address gaps in dental care in Missouri. "Missouri has six counties with no dentists, 12 counties with one. Missouri ranks 49th in the nation in visits of children to the dentist, 47th in visits of adults to dentists. And then the dentists we have are mal-distributed. Everyone wants to live in Kansas City, St. Louis, or Springfield." ATSU already runs a dental school at its campus in Mesa, Az., which has successfully recruited students who want to serve in rural and underserved areas. The school regularly graduates the largest number of Native American dental students, who often work in clinics serving Native Americans after graduation. Magruder said that experience can be replicated in rural Missouri. "It's how you recruit the students. If you recruit the students from rural areas, they're going to tend to go to rural areas. We're going to recruit people that are already feeling that that's the way they'd like to serve, they have a calling to do this." "But it's only a drop in the bucket because the needs are so great. Most states are going to have to do a number of these things to reverse this trend." The problem, she said, is bigger than just the raw number of dentists, or even where they are located. "The system really isn't designed to serve everybody. If you live in the suburbs and you have money and a car and you have general good health and you know what you're supposed to do for self-care, the system is set up for those people. Not for anybody else. Missoui's much like the rest of the country in that there are very big gaps. Missouri is one of the worst states really, with respect to the percentage of residents in the state that have no access to care whatsoever. The dental school in Kirksville will be the state's second. The School of Dentistry at the University of Missouri, Kansas City has been churning out dentists since the late 1800s.